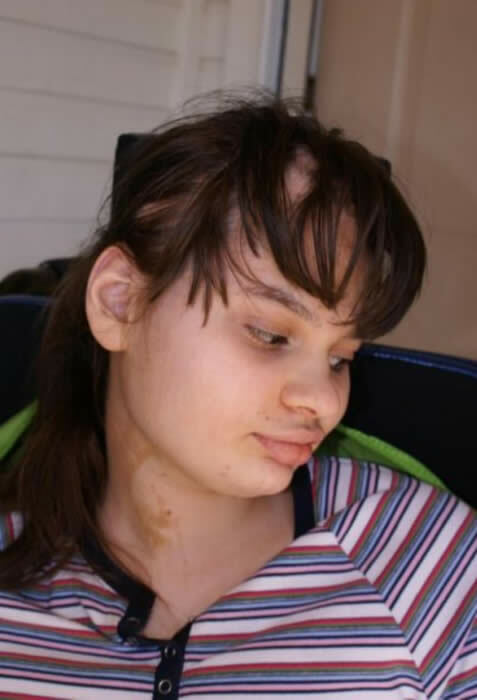 My daughter Sherry was born with D2HGA. It was still a very novel disease at that time. I think there may be about 60 D2HGA’s globally? At birth, she was tiny. Even at 36, I was a new mom and not too up on what should and shouldn't be...and by the 28th didn't have time to find out! Birth was not complicated; I was induced on 6/5/91. The only oddity at the time was when cleaning her, her hair came out where they wiped her head. This alopecia and subsequent pre-malignant melanomas is from a disorder called Linear Subaceous Nevus Syndrome and is isolated only to her, none of the other children have it. I mentioned to three different doctors that Sherry had abnormal eye movement. I was told "babies do funny things with their eyes." I was in the hospital on 6/23 with a post-partum infection from a dirty epidural stick. My best friend kept her for the night for me as she was off of breast milk. When she brought her back, she mentioned that she was doing funny things with her eyes. ​When I was discharged, we went home and I had her dad get the video cam and I taped her eye movement, grabbed the tape, called the doctor and said something was wrong with her, I taped it and we were on our way in. We didn't have an appointment but he did see us right way. For the first time was the "S" word...”It is very rare for a newborn to have seizures," Then he sent us down for a cranial ultrasound (which came back normal). By the time I got home, I had a message to call him immediately. My heart went to my stomach. He told me he viewed the tape. I was to bring her in for an EEG at 6am, then take that print out and the video with us to see a pediatric neurologist in Austin, TX. Things went to hell in a hand basket from then one. Seizures continued to increase both in number and in severity so we were in and out of the hospital 5 times before she was 3 months old. (Our longest stay in-patient was 65 days) When she was 3 months old, we had been home from the hospital about 3 hours. I set her in her infant swing and went into the kitchen to get some tea. When I looked at her (kitchen and dining room were adjoined) I saw her color was deep red. I ran and picked her up, tipped her over to let any formula still in her mouth should she have spit up out. She was in a prolonged tonic (stiff) stage of seizure. She was purple/red and she wasn't breathing. Holding her was like holding a hard rubber baby doll. By the time I called 9-1-1 she was breathing on her own, but she was still blue and her heart rate was over 200. (she was just a few days over 3 months then) We went to Spark's office from ER and we stayed there until there was a medical provider to meet us at home with monitors and oxygen. Didn't need to use it but 4 days as we were headed back to the hospital. It was during this time, lab work came in that she had some form of Glutaric Acid but it was not quite like what they usually see in labs. I had the choice of Texas Children’s' in Houston or Dallas, TX. I asked her doctor who had the best and he said Houston. Within 5 hours, we were in their ER after a quick trip by ambulance. Once there, they confirmed my suspicion that Sherry had gone blind during her last seizure. We were in ICU for a couple of days, then PCU, and then sent up to a room. It so happened that the genetic/metabolic team were working with a research group in Europe, headed by Dr. Cornelius Jacobs. They were studying L-2-Hydroxyglutaric. This was Sherry's initial diagnosis and I was told she would not survive 6 weeks and very likely be able to survive even another three weeks. Typically, children with L2HGA did not have the type of presentation and severity that Sherry had. It was some weeks later that Dr. Jacobs had come across some data published by Drs. Chalmers and Nyhan, et al, in 1983 on an adult male who excreted d2h in urine and had a protein losing enteropathy. The had no D2H found in blood serums or cerebral spinal fluid, nor were there any elevations of GABA. Dr. Jacobs had then identified Sherry as having the D-isomer of 2hga rather than L-isomer. There was no protocol for treating it. We just did not know anything about it so she was give the same treatment regime as children with L2HGA. We had a formula base called Product 80056, Promod (protein) and Polycose (calories) that I mixed with distilled water to their prescribed measurements. By this time, she was eating rice cereal and oatmeal mixed with her special formula. She also loved bananas. She was put on Riboflavin which she projectile vomited after every dose so this was discontinued. She was also placed on carnitine. (we stopped giving her that when she was about 11 years old and maintaining a steady level on her own). We were already on Reglan for reflux and by that time we were on Tegretol, Phenobarbital, Dilantin and Lamictal for seizures. Being on 4 together were not maintaining seizure control. We have been on every available seizure medication on the market. We are currently on Zonnegran and Clonazapam and the biggest control means for her seizures and over-all health has been cornstarch. Sherry has been on ketogenic diet and failed miserably because of inability to metabolize the high fat content and low protein and tightly restricted carbs. Myself and some others have found that they did better on high carbohydrate diets, lots of starchy foods, veggies and fruit. She gets a lot of pastas and potatoes and bananas. Sherry has had a lot of problems in between. She had her g-button put in when she was 1 1/2 years old. Also when she was 1 1/2 she had her sister Grace. She was the first amnio check for D2H and unfortunately had levels even higher than Sherry's. I lost her mid-term, about 23-27 weeks, on 12/28/92. I sent her body first to Houston and from there to Amsterdam. If I had to lose her, I wanted her life to have meaning by providing information to help Sherry and any other children that followed. Fortunately she did. When Sherry was 3 years old, her little brother was born. The amnio on him showed he was negative for D2HGA but he had a different metabolic disorder that threw us all for a loop called Hydroxymethylmalonic Acidosis. Fortunately, we caught it during newborn screening... as soon as he was born, his first urine was collected, dry-iced and flown priority to Amsterdam. Dr. Jacobs called Houston and they called me to bring him in. He responded to treatment and has been free from HMMA since. His levels were so ridiculously high, that we had a repeat level done when he was 8 years old and levels were still in normal range. We pushed for expanded newborn screening. It saved Nathan. Sherry is still cortically blind, she can sit independently. She lost the ability to bumper-rump, which is how she moved around in 2001. Her vision has come and gone but mostly stays to within a one foot range up to one meter. Depends on how her seizures are at the time. She has good word comprehension. She does not speak, but she uses gestures, expressions, tones and handclaps to communicate. She can finger-feed herself and she can get a spoon to her mouth and out if you can hand it to her... heck, she will TAKE it from you... she does not like to be fed if she can do it herself. It has been a bumpy time from the time she was born until now. Thank God for Nathan because at almost 14 years old, he is a big help to me with his "Big Sissy Who Is Little" as he used to call her when he was little. Sometimes things get scary. She has quit breathing several times during the early years; we have had epileptic statis, metabolic crisis. She has had a number of surgeries. she has had a fundoplication and nissen, she has an ileostomy, she has a vagal nerve stimulator (which is absolutely useless for seizure control... and after surgery to correct defective wiring and stimulator-it has yet to do well. the wires fractured and this is again a problem coming up with the new wires), she has a portacath implanted but it is not positioned so we can't access it, this is going to require an additional surgery. She has the spondyloenchondromatosis, linear subaceous and epidermal nevus syndrome, intractable seizures, cortical blindness, severe developmental delay, movement disorder, ileostomy, and she is the most beautiful wonderful child that any mother could ask for. When she smiles your entire heart lights up. She has an indomitable spirit and courage that you rarely see in adults. I hate having IV sticks and she no longer even flinches. I cry for the child she could have been and rejoice for the one she is. I still grieve for my little Grace and always will because I loved her and wanted her so much, something just aren't meant to be... you make decisions out of love and they are hard to live with. Every milestone achieved is a celebration, every birthday is a victory. I cry for her when I know she is in such deep pain and never complains, sometimes I cry when people are crude and have said things about her in front of me, but those are tears of anger which for them are extremely dangerous tears! I still have times when I am afraid for her but know that I can't dwell on those things that do, we just push on ahead because this is how we live our life. I found myself with a great responsibility and a great joy and I know that all of us feel this way about our very precious gifts. Getting around with Sherry I have a hoyer-lift, a ceiling track Liko lift, finally a multi-lift to get her from her wheelchair into the seat of the van, and a wheelchair lift attached to the back of the van so I don't have to worry about trying to break one apart or lift the pieces anymore. I'm almost 52 years old so I'm not as spry or strong as I used to be, but this is because of the medical mess and not mental and inside energy! Sherry's spondyloenchondromatosis reveal bone tumors inside and outside the humorous and tibia. We are trying to get into the hospital to get her port re-positioned for access and a full body DXA (CT) scan. She has to be sedated for this because of her movement disorder (Chorea). This will only be done if she is there as an in-patient. Right now there are no changes to the tumors but we are watching those carefully. Should there be any change she would have to start radiation. So far things have remained the same.